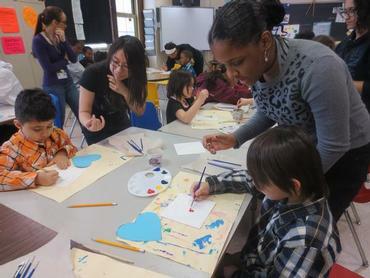 Henninger advanced art students traveled to Ed Smith elementary school recently, to help kindergarten and first-grade students create heart paintings to display their love of art. The young students learned about how to mix colors, how to clean paint brushes, painting techniques, and more. As part of their effort to impart a love of art into the younger students, Henninger students also provided a sketchbook to each first grader who took part in the activity, and they customized the covers to meet the students’ interests. One included a colorful sketch of a treehouse; another, a sports team. Several included SpongeBob SquarePants. The students’ artwork will be put together to create two posters: one to hang in the SCSD Central Office, and one to hang in Ed Smith School. SCSD Educational Foundation funded the project.